Less than 500 places left !!!!!! We’re pleased to announce for 2019 the race is once again sponsored by PGS Law who are a leading full service law firm in South Shields, providing expert legal advice to private and business clients. We’re looking forward to seeing plenty of their team joining us on the day. We welcome the involvement of local businesses in supporting our event, if you would like to get involved please contact the Race Director. You can enter online here. 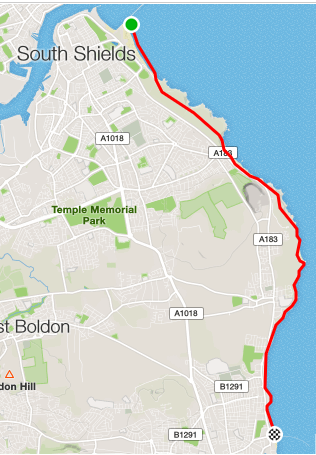 This is one of the most scenic runs in the north east along the coastline from South Shields to Sunderland following the coastal paths. The Run starts besides the Pier at South Shields (A bus sevice is available from finish to the start before the race, please choose this with your entry if you require it). After roughly a mile along the sandy beach the race moves to The Leas, here you can choose any route apart from the road or footpath down to Souter lighthouse. Anyone using the road or footpath WILL be disqualified. At Souter Lighthouse there is a water station and then the race moves to the coastal path down to Sunderland, eventually moving back to the beach for the finish. The Whole race is approx 7 miles (11k) and starts at 10am. No anyone is able to enter whether they are affiliated to a running club or not. Any remaining entries on the day will be available from 8:15am in the car park by the amusement arcade in South Shields. They will cost £30. Note this race has been a sell out for the last 2 years. The race has a cut off time of 2 hours, the distance is approximately 7 miles. Therefore providing you are faster than around 17 minute miles you’ll be absolutely fine and very welcome. Last years final finisher completed the course in 108 minutes (that’s an average pace of over 15 minute miles). Please mail the Club Secretary Pier2Pier@sunderlandstrollers.co.uk. If you wish to transfer your number please send you replacements name replacement, name / DOB / email / UKA number (if applicable) and Club. Note transfers will be allowed until 5PM on 18 May. There will be a goodie bag for all finishers. We pride ourselves on providing unusual and innovative goodies and we aim to do the same this year. Hi can you run to raise money for a charity? Is there any return transport to south Shields after the race. Do we collect our race number on the day or is it posted to us? Race numbers will be posted out before the race, for late entries they can be collected on the day, this will be communicated on the website. Every entrant should have receive an email, please check your junk or spam folder. I’m sorry but the policy is no refunds or deferrals, numbers however can be transferred up until 5PM on 18 May. I have tried 6 times to enter. Re tried tonight again twice and it just times me out when it comes to payment. Is anyone else having any problem? Yes, Jean. Having the same problem myself now. Did you get sorted? We’re not aware of any reason why you’re struggling, certainly plenty of others are managing to sign up without a problem. I have sent a FB message to the race director with regards to payment. I have concerns about the payment page. Have checked all of the payment arrangements, no concerns but due to the site being hosted in Germany it can offer some unusual options. I have had a problem with registering. I get right processing payment, then nothing! I’m afraid that the problem must be at your end as the website is working fine and taking new entries all the time. It may be that your anti-virus software is not liking that the website is Germany based, others have also experienced problems trying to register from work computers (NHS, HMRC etc) rather than from home. Participants must be at least 16 years old on the date of the race. Is this event sold out? Will there be a release of any more tickets? Was really hoping to do this and didn’t think it would sell out so soon. I’m afraid there will be no more entries released, our total numbers are capped by English Athletics. If you can find someone who has an entry but can no longer run we will process transfer entries up to the day before. Do you have a waiting list for any further places that may become available? No, we are not operating a waiting list as people don’t generally return their entries, they find another runner to take over their place. We ask that they let us know the details so that we can update the database. When the race numbers are posted out do you also get confirmation of your bus reservation? Yes, those who paid for their bus ticket on entry will have their ticket stuck to their race number. Don’t worry if you didn’t buy a ticket on entry, just bring £2 with you on the day. We have more buses than ever before this year so there should be plenty of room for everyone, first bus leaves at 8am. Can we still book the bus from Sunderland to South Shields before the race starts? We did not request this with our entry and are wondering if we can still arrange it now? No need to book, there will be plenty of space as we’ve added an extra bus this year. Just turn up at Roker from 8am with £2 and we’ll have you up at South Shields ready for the start. Thank you very much 4 today this is the third time i have done this race and have enjoyed it again atmosphere was brilliant and first time i have ran more than 3 miles without music. The goody bags are always amazing. See u all next year. When will entries open in November 2018 for 2019 Pier to Pier? Hopefully at the weekend, just waiting for some information from our sponsors. hi when is the 2019 pier to pier out? Should be this week, just waiting back for some details from our sponsors.